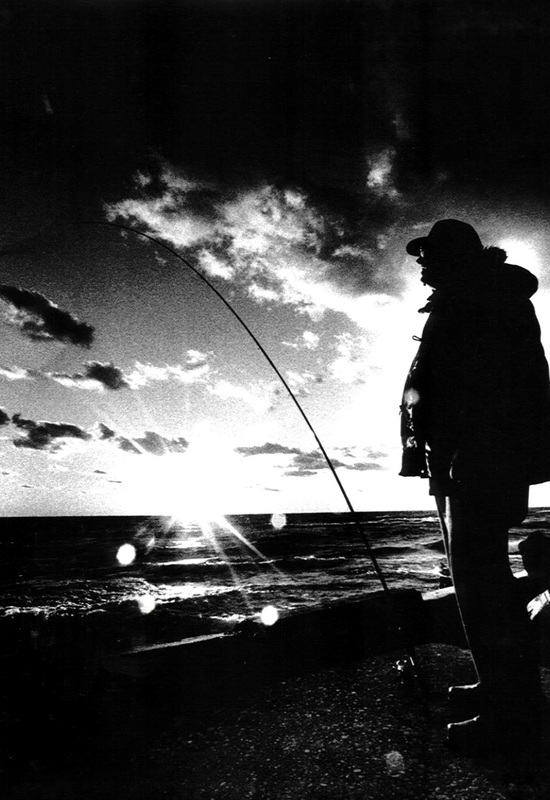 A number of years ago I was shooting in Muskegon, Michigan, for the Muskegon Chronicle, and over time discovered that one of the favorite things for local folks to do was to just go down to the lake (Lake Michigan) and watch the sun set. It was a tradition, it was peaceful, it was pretty. She said, “Oh, look, I can see my shadow!” (as opposed to reflection). The reason the car comes into the picture is that it had Ohio plates on it. Put that on the back burner for just a little bit. I got down to the lake – and – oh, another important thing. I’d found that shooting with ‘normal’ lenses just didn’t work for me – and found myself shooting with an 18 mm super wide angle lens on one camera body, and a 300 mm telephoto on the other. You don’t get much more of a spread than that. I figured that if I was close enough to shoot something up close, I wanted to be right in its face, hence the 18… if I couldn’t be in its face, I needed to reach out and touch it – with the 300. In this case, I saw a bunch of guys fishing at the edge of the lake – and figured I sure didn’t need the 300 – so the 18 it was. I was thinking the shot through as I walked closer, and to get him in the shot, along with the sky and the sunset and everything, I’d end up kneeling on the ground and shooting up at him – so I went over and chatted for a bit, then got into position to shoot. And a police car pulled up. And Tom, with expired, out of state plates, suddenly got really, REALLY nervous. I didn’t know what he could/would do – but if there were some problems, they’d have been bigger ones than I was capable of dealing with right then. So I did the only thing I could think of, and ignored him, figuring he might not think that the car was mine – or something like that. (note: this would be an example of the application of the Infinite Wisdom of Youth®). …and the cop kind of faded from my consciousness. If I hadn’t already been kneeling, I would have been very quickly. I slowly turned around, to see, much to my horror, that the image my terrified mind had conjured up was right. The hand on my shoulder wasn’t attached to a gorilla, it was worse. It was attached to an arm in a policeman’s uniform. I don’t know what my face looked like but as my eyes worked their way up that sleeve, I saw that the face on the policeman attached to it was smiling. …which had a little disposable camera in it. The cop’s smile got even bigger. The relief that was pouring through my body was like cold water on a dry lakebed. Cooling, sizzling as it hit the hot surface, it soaked in to cool it to the core. I laughed with the policeman, joked with him a bit about how his lens very likely outclassed mine, and so on. He promised to have a copy of the print at the paper as soon as it was developed, and true to his word, he did. Oh – one more thing… he never mentioned the license plate…. Fishing at Lake Michigan – and… you never know when you’re being watched. No – not the kind of transmissions you’re thinking about. These transmissions are 4 speed, on the column… That kind of transmission. I had some car trouble one day back when I was going to school at Fort Steilacoom Community College (now called Pierce College). It was payday, (I’d gotten my work study check of $124.96 – gad, WHY do I remember this stuff and still can’t remember where I left my cell phone?) – I got home, planning on cashing it – when my dad, who’d had a 1966 Saab 96 Sport and loved it until it turned into a Flintstone Mobile (the floor rusted out and you could see the road going by through the hole), called me over and read me this ad in the paper. Now even back then (about 25 years ago) this was a touch on the cheap side. But also even back then, Saabs were a lot like Lays potato chips – you couldn’t eat just one… – (you needed another one for parts to keep the first one running) so I called the guy…. Understand at the time, I’d been used to driving a 3 cylinder, 2 stroke Saab that, as I mentioned in another story, was clearly the result of an illicit liaison between a Sherman tank and a chainsaw, so more power was always better – but there was something about how he was describing this power that piqued my interest enough to realize a couple of things. He was telling me things he didn’t realize he was telling me. I was going to have him tell me the rest without him realizing he was doing it. And I asked about the glass – in large part because I wanted to know if they’d rolled the car. The way he was talking – this was a distinct possibility – and so I wanted to check. The thing is, I happen to know that if you roll the car, you’ll likely scrape one side, maybe scrape the roof, but if you hit the roof, there’s well north of a 90% chance that you’ll end up with a diagonal crack in the windshield. The car’s got a built in roll cage, so it’s not like it would have been toast – but it was information I wanted to know if I were to buy the car. It was a simple equation… one roll equals one crack, so… innocent sounding question, but the answer would have told me a lot. The Saab is – well, you’ll figure it out… trust me. So depending on how you do it – you can just muff up the body a little bit – but bottom line, that windshield is going to get cracked, so I asked about it. Eventually I determined that the body of the car appeared to be good, but the right door might have some issues. Okay, whatever. …and a “banging” to me is the sound of sheet metal. A “banging noise” is in the higher frequency of sounds. It is a cheap sound. A “thunking noise” is not sheet metal. It is the sound of something internal, like bearings, or worse yet, gears. It is in the lower frequency of sounds. You do not want to hear thunking. It is an expensive sound. So I do a little more asking – kind of a last confirmation of the condition of the body, and he finally pops out with something he’d clearly forgotten. So I’m thinking – given where I grew up (near Fort Lewis or other military installations my dad was stationed at), the hole would be about 3/8 of an inch in diameter, and at the center of a little dent…. I’m thinking it’s the standard military issue bullet hole, I mean: “Hole, comma, bullet…. one each…” Simple to create, simple to fix. Turns out his buddy’d been commuting down to the tideflats in Tacoma with it, and ran a forklift through the driver’s door and one of the tines did indeed make a hole… about the size of a man’s hand… in the driver’s door. So I got the address of the place, and as dad and I drove out there to find it, we noticed that this was not a neighborhood of manicured lawns and well-tended gardens. It was more a neighborhood of dead grass, faded plastic toys, and rusting cars. … well, my son once said that while some of his friends had made nasty comments about rednecks, he had absolutely nothing against them because they were so ingenious and so ridiculously practical. You’ve seen the picture of the redneck whose air conditioning broke in his car, but he happened to have a generator and a house sized window air conditioner handy. So he bolted the generator to the trunk of his car, mounted the air conditioner in the right rear window, and then, when it was hot, he’d fire up the generator, fire up the air conditioner, and grow icicles in the car. Not “cool” – but definitely cool. These guys were the same way. If they could make it work – it worked. You’ll see this in a minute. So my dad and I drove out there, and sure enough – it was a V-4, not a 3 cylinder like my other Saab. After a bit of looking around, I noticed all the body work on the car was good, just like he said on the phone. Except for the passenger’s door, which was scraped up pretty bad. A nice… big… diagonal one that went from top to bottom. The stories the car was telling me were just a touch different than the stories the owner was telling me. But I watched, and looked, and after he started it up – I listened. The three cylinder, two stroke engine in the other Saab sounded like a swarm of seriously irritated hornets. Powerful? No. If you heard it, you might look around because you were sure a tree was being cut down by that chainsaw you were hearing. If it isn’t clear from what we saw earlier, it turns out these were a bunch of Harley bikers – and after a little chatting, the stories the owner was telling me started to match the stories the car was telling me. I remember asking, “Has it ever been rolled?” – and later thinking, “How often do you ask the owner of a car you’re about to buy “IF” it’s been rolled – wouldn’t it be obvious? Well – with this car – it could be done. Not often, and not without consequences, but it could definitely be done. What started off as a “Nope, never been rolled” turned into a reluctant “Well, once, a bit…” when I told him the stories the car was telling me. And then, since we were telling stories, he told me the story about one of their excursions determining precisely HOW strong this engine was, driving up this dry riverbed, they rolled the car and got a bunch of gravel in the engine compartment and broke the motor mounts while cracking the windshield. In doing so, they also blasted the crap out of that original exhaust system. In fact, there was nothing remaining of it. But fixing it would have been expensive, and one of the things about redneck ingenuity was that if you could make it work, you would make it work. And so they’d attached a piece of flex tube down from each of the exhaust manifolds – one on either side of the engine – and they went under the car just like the normal ones had gone, but instead of that resonating chamber, they went back about two feet. There were a couple of little baffles screwed on the end and that was it. It was the shortest, smallest, simplest “dual high performance exhaust” I’d ever seen. I asked if I could take it for a test drive, he agreed, so I got in, fired it up (oooh, that sounded nice) – hit the clutch, and put it in first, let up on the clutch – and…. Holy cow…. what the HECK had they done to this transmission? …the sound of a transmission beating itself to death. So I did the only thing I could possibly do under the circumstances. And started it out slowly in third gear – with the banging – made it to fourth, and drove the thing home, with dad following me. Every now and then you could smell gear oil. This was, to use a technical term, “bad.” Gear oil is supposed to stay inside the transmission (with the gears, hence the name). I took the engine out, took the transmission out, and realized the ring gear (part of the ring and pinion set of gears in a gearbox) was missing more teeth than a hockey player. I found six of them in the bottom of the transmission casing. In fact, on top of everything else, the “rolling the car” physics experiments the previous owners had done proving this whole “STRONG engine” concept broke the starter off the engine block. Note: The starter is bolted on to the engine through a hunk of cast steel about an inch and a half think. This hunk of cast steel had been broken off… and with redneck ingenuity, had been welded back on. The car, however, had one minor issue. In fact fact… nothing under the hood… at all. So now I had two Saabs sitting in my parent’s back yard, one with nothing under the hood at all, and one with a STRONG engine, with no way to use the power. Speaking of power, it was clear it was time to call on some higher power, and so I did the only thing I could at the time. Not the way I prayed…. Ever have a kid whine at you? a kid who really, REALLY wanted something? The kind that was pestering the living crap out of you to the point where you just wanted the noise to go away to the point where no matter what it was, you would give it to them just to shut them up? I have to tell you – I have never, ever heard so much nothing coming back from a prayer of any kind. I mean, even the “God bless Mom and Dad and…” (insert requisite list of friends, relatives, pets both living and dead and so on) seemed to get more of a response than this – even if it was just an echo. I mean, there’s quiet, there’s silence, and then there’s that stunned silence you get when you’ve heard something totally unexpected and simply can’t think of anything to say. And then… Oh Lordy… He had a sense of humor. Now the thing was, I didn’t have any other options here… I’d priced out VW transmissions at the time just to get a sense of what a transmission cost, and they were running in the $375.00 range. I also didn’t have a transmission. I’d looked for transmissions, and they were rarer than Sasquatches in Singapore. I kept at this for six months. Then one day, the weirdest thing happened. I was praying – oh let’s get real – this wasn’t praying, this was pestering…. It seemed like God finally got tired of me whining about this fool transmission, and out of the silence I’d experienced for months came this message, so loud, so clear, that I looked around trying to figure out who’d said it. Wait – Fedex? UPS? I mean, if you’re sending me one, can I have a tracking number or something? On the other hand, I was praying, for Heaven’s sake (pardon the pun) – what should I have expected? I wasn’t sure what to do for a while there. Wilkeson and Carbonado are two towns close to Mt. Rainier that were – well, not quite in the middle of nowhere, but you could see it from there. There were no Saabs out there at all. So we headed further out – and – well- you’ve heard of the boondocks? Depending on what part of the country you’re from, past the boondocks is what’s known as the pucker brush, past that is the toolies. We were on the border of toolies and whatever’s past that. No one knows for sure. They’ve never come back to tell us. Oil on the ground to the point where it’s either congealed or in rainbows in the puddles. Oh, and mud. Have to have the mud. Except whoever ordered this junk yard didn’t check that box. Now if you were to think of something that guarded a wrecking yard – or a junk yard, what type of potentially living organism would your mind conjure up? I mean, you could come up with something mean, like a pit bull, or a Doberman, or a Rottweiler… Heck, any junkyard dog could work. You could go one better and get Leroy Brown. But the person who was filling out the checkbox on the “Standard Junkyard Order Form” had found the box marked “other” and filled in the blank. When Clark and I got out of the car, we didn’t see a pack of dogs, we didn’t hear an ominous growl, heck, we didn’t even see Leroy. We were attacked by a herd of wild freaking geese. Have you EVER been attacked by a herd… herd?… flock? …a bunch of geese? I mean, they don’t growl, they hiss. They’ve got these long necks that you could grab, but – there were so many of them! Which neck do you grab? It was like trying to wrestle with a plate of spaghetti. While we were standing there flailing our arms at these necks, looking just exactly like the sissies we were, someone came out of the made to order shack and called them off. For that matter, the question of, “Geese can be trained?” popped into my mind, I mean, the only term I’d heard about what you do with a goose was cook it. And the gooses – er – geese – obeyed… they waddled back through the gate into the junkyard. And it was a threatening waddle, too, I might add. Clark and I just stared at each other for a minute. We followed the geese in – daintily stepping around little landmines they’d left behind, and found real humans to talk to. If he said no, we’d thread our way through the geese and their landmines again and leave. If he said anything else, we were in. …and he gestured in a direction that used up roughly a quarter of a standard compass. I popped the hood, and sure enough, everything under the hood was still there, and I mean *everything*. And behind the engine in there was a transmission…. I had no idea what to do now that I’d found it. “Well,” thought I, figuring that if a chat with God could result in a transmission, maybe another chat with God could help me actually get the dang thing. Okay, this was now officially weird… First off, I wasn’t quite used to ‘hearing’ God like that – so my weirdometer was getting pretty close to pegged on this. But regardless, somewhere in the standard negotiation tactics I figured there had to be something about talking… I mean, how do you do negotiations without talking? I didn’t care, the engine was just in the way of what I wanted, the transmission. I rode home kind of in a daze – and sure enough, went out there the next day and yanked the engine and transmission out, paid the gentleman $60.00 and brought it home. I took the two apart, bolted the STRONG engine to the $30.00 transmission, put them in the free car that I’d been given if I’d take it away, hooked the rest of the stuff up, and started it up. I drove that car for 17 years. I’d heard this before. Many years before, and I knew what it meant. I thought I might be able to make it home – but work was 17 miles from home, through some pretty awful traffic, and some steep hills. I gently accelerated, and the thunking noise turned into a banging noise, and that $30.00 transmission – after 17 years of work – gently let me know that it didn’t have anything left to give. Interestingly enough, I was now in the very same position I’d been in many years earlier – lots of power from that “STRONG Engine” and no way to get it to the ground. I called around and found out that it would cost 1700.00 to rebuild it. I went up there to look at the car. It was indeed the same year, and the same color. It had been this lady’s first car – she’d bought it when she was in college, and when she left home – she left the car in her dad’s barn. He retired, and needed something to do, so he had the engine rebuilt. And he had the transmission rebuilt, and then one day, after he’d gotten so much fixed and done, he called her over from where she lived, 12 miles away, to give her her old car back. With a father’s pride – he handed her the keys to her car – and what had been his project for the last few years. But she’d grown past it – and so she drove it from Snohomish to Everett and put a for sale sign on it. All but the last digit on the VIN number were identical. I popped the hood of the original one – xxxxxO. And went back to look at the new one… xxxxx6. So in the end, two cars that must have been made on or about the same day, but six cars apart, by the same people, had been acquired about 20 years apart, were once again sitting next to each other, in my driveway. wheels, but would be able to balance a little on their own? speed that’s best for them. A dad I saw out on a walk who clearly got it. But what happens on your end is that you help them as long as you can. You hold onto the saddle until you feel their pedaling is smoother and steadier. You hold onto the saddle until they’re pedaling faster than you can run. And you know that if you continue to hold onto the saddle at this point, they can’t ride their bike. You will, quite literally, be holding them back. And you realize in a split second, that you have to let go. And to do that, you have to loosen your grip. In that one moment, everything changes. 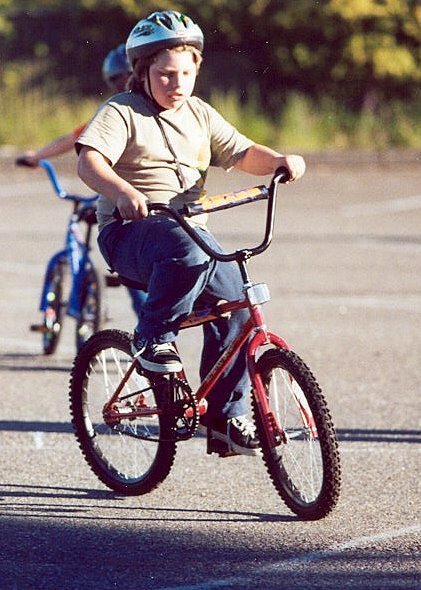 If you hang on – your child will only be able to ride as fast as you can run – and that simply isn’t fast enough. 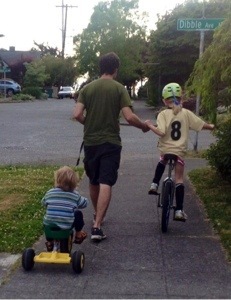 I’ve talked to several dads who taught their kids to ride bikes – and as I did, they all instinctively held their right hand down as if they were holding onto a saddle as they told their stories. They knew the ride would be wobbly at first. That there would be falls, and Band-aids, and trips to the emergency room. There always are as your child starts to understand this new-found independence. a chance to stop him before he fell out, and down the steps. exactly like Worf from Star Trek. He cried so hard, and it hurt his head so bad, almost as much as it hurt my heart as I was holding him. – Do you remember their first step? – Or their first word? – Or their first bite of “real” food? behind it as it left. You find yourself startled – “Would I have done something different if I’d known this was the last…” whatever it was… If you’d known it was the last bottle you’d ever give them, the last baby food you’d ever do the airplane thing into the hangar with that we all do as parents, or the last diaper you changed on them. Do you remember their first day of kindergarten? weren’t the one to tuck them in? There’s no one skateboarding down the stairs. There’s no one screaming about who’s hitting who. There’s no one stomping through the living room like the bass section of a marching band of elephants. comes right in with them, but so does the joy of having them back. remember how hard she was trying to learn how to parallel park. and put it in park. She wasn’t convinced… At all. parking thing – until she got it, in her own time. No card could have been better than that. In spite of the fact that she’d been living away from home for several years at that time, I felt I could let go of that particular saddle with a little more grace right then… With all of the challenges a young adult has in these times, she’s doing well. I taught him and I didn’t even realize it? What does that mean – what else have I taught him without realizing it? I taught him stuff I wanted him to know without realizing it – what have I taught him that I’d rather he not know? Do I need to go back and try to undo things? speaking of “stuff – didn’t it scare the – uh – “stuff” out of you? their fingers from that saddle. any kid off can be very, very quiet. It might be the first time the back seat of the car’s been empty in years. It is hard to get used to. herself wasn’t ready to let it go. Knowing when to do that is one of the hardest things to do as a parent. ways you’ve hurt before, and your heart just aches for them. You understand a bit of it – but you can’t actually say that, now’s not the time. You want to grab the saddle again, you want to rip it from the bike and use it to whack the crap out of the person who did this to your kid. coffee, or a beer. Sometimes it’s going for a walk or a drive. Your kid needs to feel your hand on the saddle right then until they’re steadier, and when they’re ready, they’ll start pedaling again, and it will be time for you to let go. This, as you may have guessed, will repeat itself through your life, throughout their lives. You will find, over the years, that they “ride their bike” in circles around you. And your job is to do exactly what you did when they were little. You show them you love them. The machine wasn’t breathing for him anymore. His mind was clear, not muddled by a stroke. We imagine he looked around, saw the things we’d brought in to make him feel at home, saw his beloved wife laying there, who’d been with him for 41 years, for better or worse, for richer or for poorer, in sickness and in health, and with his new, whole body, then left the presence of his wife to be with his Lord. He’d let go of the saddle, one last time. Run with your kids while you have them. Love your kids while you can. Hug them as often as you can. And then you cheer them on. get plopped into the stroller and show up someplace else. and what it takes to move you around. the story changes, because you’re no longer in control. two wheeler – of course, with training wheels. kid learns at a speed that’s best for them. saddle until they’re pedaling faster than you can run. split second, that you have to let go. And you loosen your grip. and you let go of the saddle. In that moment, everything changes. run – and that simply isn’t fast enough. hand down as if they were holding onto a saddle. as they ride forward with the excitement of youth. Star Trek. He cried so hard, and it hurt so bad. first word, or their first bite of “real” food. quietly behind it as it left. be? The last time you saw them? repeats itself all through their lives. you weren’t the one to tuck them in? one skateboarding down the stairs. screaming about who’s hitting who. balance when the kids come crashing through the door again. got it, in her own time. have been better than that. these times, she’s doing well. what else have I taught him without realizing it? that I’d rather he not know? “stuff – didn’t it scare the – uh – “stuff” out of you? time the back seat of the car’s been empty in years. crap out of the person who did this to your kid. what you did when they were little. afternoon in 2000, I read it to him. wife to be with his Lord. you, they need to know you’re there.